- Improvements to aircraft initialisation system - the aircraft will be initialised in a 'cold & dark' or 'ready for takeoff' state depending on the state of the previously selected aircraft. Power icon on 2D panel selector can now only be used whilst on the ground to avoid inadvertent use. - Cockpit state saving added - the panel state will be automatically saved whenever a flight is saved and reloaded when that flight is loaded. - Improvements to Navigator TV displays, including font sizing and brightness, defaulting to powered on and faster loading times when navigating menus/pages. 2D and VC displays can be operated independently. - Improved panel state system. The panel state will be automatically saved whenever a flight is saved and reloaded when that flight is loaded. 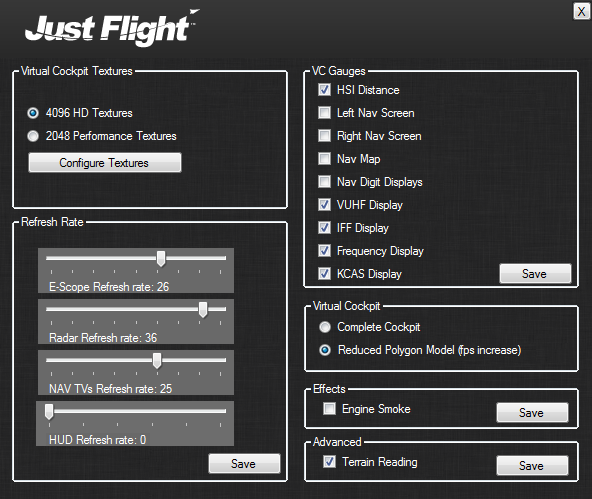 Note: The configuration tool has been updated to include sliders which control the refresh rates of the main virtual cockpit displays. The refresh rate of these displays can impact performance - the less often the displays are refreshed, the greater the performance (FPS). The default values (as shown in the image below) offer the best compromise between performance and display smoothness. Moving the sliders to the left (decreasing the corresponding value) increases refresh rate and reduces performance, and moving the sliders to the right (increasing the corresponding value) reduces refresh rate and increases performance. The tool still includes the option to disable these displays completely if required. - Map now configurable using the left TV screen. Lots more information can now be displayed on the map, depending on your preference. - 2D TV screens no longer need to be full screen and can now be resized (available in front-seat configuration only). - Jettison panel fixed, and functionality added to 2D panel. - Incorrect VSI value on variometer when in Radar Height mode corrected. - AFDS bite guard animation fixed. - Canopy can now be opened when power is off, providing pressure accumulator has sufficient pressure. - Terrain reading can now be turned off using the configuration tool (for possible FPS gain). - Speed 'bouncing' with elevator use - should now be gone. - Crashing issue with Flight Analysis Tool fixed. - Crashes fixed when loading flight plans with long filenames. - Product now ships in front-seat only configuration by default. - Installer now creates separate links to the tool-set for each sim the Tornado is installed into. Special thanks to Military Sound Studio for providing the canopy horn sound that is included in this service pack.